Summary: Naoko Noda, who works in a trading company, is called “anego” by her younger co-workers. 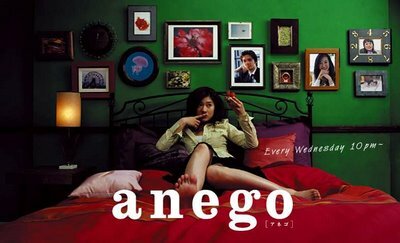 What is “anego”? It means “older sister,” but in this case it is given as a nickname to Naoko because she is like a big sister to her coworkers, who depend on her to give them advice about everything. This drama, based on a popular novel, depicts realistically how Naoko lives her everyday life, including her love life, the problems she faces, and her uneasiness about the future. Naoko, 32, works in the corporate strategy division. She is single, and has been working hard for 10 years, now she often finds herself in the role of training and guiding the younger female workers. Recently she realizes that most of the temporary and contracted workers’ goals are to find an elite male employee within the company to marry. Naoko also hopes that the man of her dreams, a prince on a white horse will one day come into her life, but it seems like her younger co-workers are always the ones who win the hearts of all the elite men. One day, on the way home from work, a handsome man saves Naoko from a drunk man who was bothering her, but she sees the wedding ring on his finger, and feels the emptiness of being single. One day, Naoko goes out to play golf with the general manager and other co-workers, and there she unexpectedly meets her former co-worker, Eriko Sawaki. Eriko seems to have a picture-perfect life; she is married to a company president, and already has one child. Naoko gets distracted by Eriko and the happy atmosphere around her, and ends up with a terrible golf score. After finishing the round, Eriko’s husband comes to pick her up, and Naoko is surprised when she sees his face. Eriko’s husband is the handsome man who saved her from the drunk man. Naoko’s heart starts pounding, and she can’t help but envy Eriko’s happy life. When working women reach their 30s, they start to worry about various things; “How long should I continue working for this company?”, “Will I marry the man I am dating?” “If I continue living like this what will I do when I grow old?” etc. In this drama, the main character, who is a 32-year old single woman working at a prestigious trading company, suddenly finds herself as one of the elders at the office, being a big sister to her younger co-workers. From the outside, it seems like she is a happy and successful businesswoman, but inside she is insecure and worried about her future. This drama, through the main character, portrays the everyday life of working women realistically; what they are really thinking, the problems they face, and how they do their best to survive in this world.